We track each child's progress using these cute punch cards found HERE. Then when a child completes their punch card, we hand out a certificate and giant chocolate candy bar! They LOVE it! I just printed the certiciates and candy wrappers HERE. 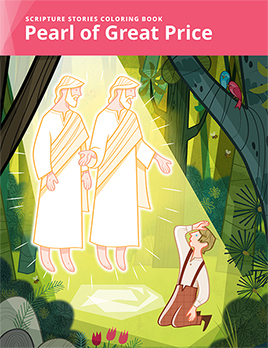 We've also started passing out the Scripture Stories Coloring Book - Pearl of Great Price. I've got more details on that HERE. This is a great idea for those who want to stay away from treat-related rewards and/or food allergies. 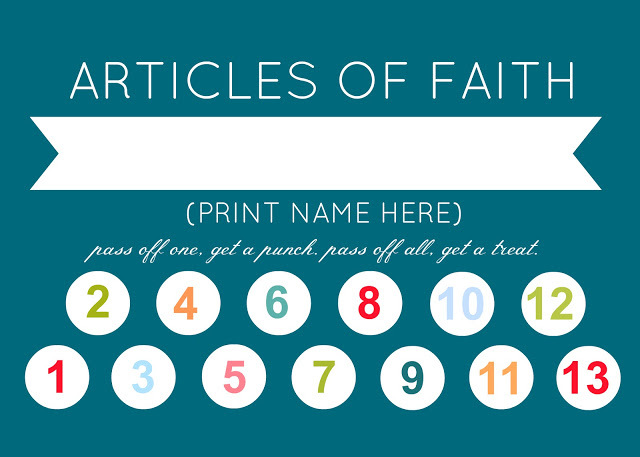 It's been a really fun and simple way to motivate the primary kids to learn their Articles of Faith! Thank you so much Camille for your wonderful site! You are truly inspiring!!! 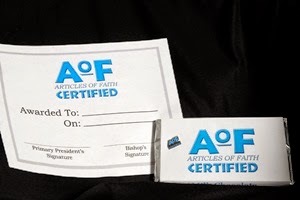 I love what you've done with the Articles of Faith and helping the kids to memorize them. I plan to implement it this year in singing time. So far I've printed out and created the visual aide note book and punch cards. Thank you! Unfortunately, the link for the certificate and candy wrapper cover doesn't work. I was wondering if there is a way to update the link or to access the handouts another way. Thank you for letting me know the link doesn't work any more - I've updated it to redirect to my own files that I previously downloaded so they are now accessible.